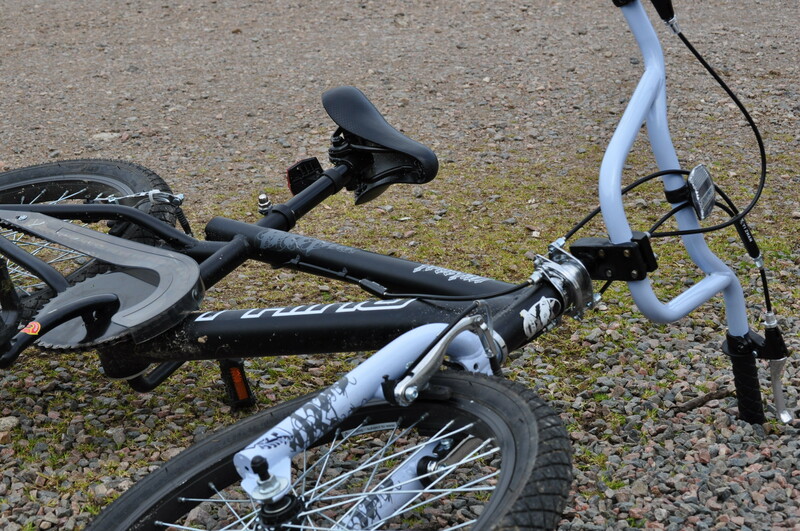 My eldest wanted a new bike at christmas, but it couldn’t just be any bike. It had to be a BMX. The reason for that was that he wanted the “cool” badge at school by having one. He also wanted to be able to start doing stunts, and needed a bike that you can turn the handlebars right round in a 360 degree circle without any cables getting in the way. I think it looks ridiculous to see those big lads on those teensy bikes, but that’s what he wanted, and thanks to a sale in a toy shop, that’s what he got. He is happy as larry, and enjoys spending time with his BMX. What it also raises is the red flag of the peer pressure and how it affects our children when they are only really very young. Right from babies, on TV there are adverts aimed at them. Cereals, sweets, toys from October onwards, and there seems little we can do to shield them from it. Even if we self consciously ban TV channels that carry the adverts, and keep them away from films and programmes that we don’t approve of – they still ARE going to find out all about them in the most gory sense of the words, and without the benefit of censoring. School playgrounds and parks are hotbeds of gossip, slander, and peer pressure. If you are at a non-uniform school and happen to wear the wrong trainers, the consequences can wound you past adulthood. When my children were very young, I decided that I would not bow to peer pressure, and that my children would wear what I bought them and be done with it. Several years on, I am glad that there are some discount sports shops and ways to get hold of sports gear and shoes at reasonable prices, or I would struggle to meet the demands that our children place on themselves, AND have placed upon them by others. Yes, there is the argument that there are children worse off than ours, and that ours should be grateful for what they have. I have had a lot to do with disadvantaged children, and believe me, that argument won’t hold water with your children, or stand up when they are being made a fool of by the children who “have”. Our children live in the socio economic circles of their peers (in most cases). They can no more understand the difficulties surrounding children who have little, than we can understand how our great great grandmothers cleaned and cooked and provided for families of 14 children or more in two rooms. What we can do, is try to keep it within reason, and not try to keep up with the children who will always have everything. Most of those children who get everything will never appreciate the value of their money, or the ability to manage a budget (you know the ones, with every new product going, and a new toy nearly every day). I have accepted that my children can not match many of those children, but I provide for some of the things that they “need” to be accepted when it fits my budget. The right trainers are do-able at the discount sports shops, as are some football kits. I buy the football boots in the sales and stock up on the next sizes. I don’t go overboard, and if my kids had their way, they would have every game console and game that is on the market (and believe me some of their friends do have that). There are times that we have to accept the peer pressure, and work within it to give our children the self-esteem that they need to live among their peers, but also be responsible enough not to let them be the pampered brats that grow up respecting nobody. It’s a fine line between showing off and being practical. Sadly, it is the children who always end up at the end of it, suffering at either end of the scale. The middle ground to me, has to be the right place to be. « Competition June 2011 – £25 Gift Card for Pledd. The key is to make your children unyielding to peer pressure, by making them value their individuality and to feel comfortable being different to the crowd sometimes. If they want something because they like it, it fits them well, it suits them, it’s comfortable etc then that is a different story, but they need to be taught that to want something just because someone else has it or because their peer group dictate that they must have it to fit in, is just weakness and a lack of individuality. We live by the maxim, “You were born unique, don’t allow yourself to become a copy”. Believe it or not you do find that children who are intrinsically different to their peers find it much easier to resist peer pressure. Simply because they have a difference which can not be altered and which has not prevented them from being accepted into a social circle. For example children of a skin colour or religion different to the majority or all of their peer group. Kids need to be taught that being different can be cool. It’s possible and it can work… this ethos saved me a fortune when my now 18 year old daughter was growing up and she had lots of friends, was extremely popular, but never afraid to be different. A great post. I hate peer pressure too and also try and strive for a middle position trying to help my children to feel included but not spoiling them. I also want my kids not expect things to be given to them on a plate and to learn that things have to be worked for. I am really shocked at how much money is spent on some children; they seem to have every gadget and fashion item going as well as holidays abroad. Its this excessive pampering that puts pressure on everyone else. Aagh. I struggle to a accept what some people are spending without thinking of the future effects. You make a very good point. Something I find sad is the way schools have suddenly invented a particular PE kit that you have to have and it doesn’t matter whether or not you can afford it. I was gobsmacked last year when they decided to change the colours from blue shorts to black and I sent Amy with the blue shorts, which fit her perfectly. However, I got a letter home saying I needed to buy Amy black shorts because she was feeling left out. That angers me. It isn’t just peer pressure but it’s coming from all angles, I’m afraid.